Almost every coping saw being sold today is set-up wrong. They are backwards. This is not a discussion of the push versus pull in terms of does it cut on the push stroke or the pull stroke. Most of them are set up to cut on the pull stroke, and I am fine with that. Where I think they make the mistake is that they position the blade in front of the centerline of the handle. This is the equivalent of rear wheel drive, it is less stable and makes the blade more likely to go off-course or bind. It also makes it harder to tell where you are headed, because the blade is leading the way and your hand is following along after it, like a backseat driver. Cutting with the blade in front of the center-line of the handle makes the saw more likely to bind, and harder to steer, because you are chasing where the saw has been, rather than where you want it to go. More than half of the coping saws available today use this arrangement of the blade being strung in front of the centerline of the handle. They may be perfectly good saws, but they could be better. Most modern coping saws have adopted this design of attaching the blades to pins at right angles to the saw path. Loosen the blade (usually done by unscrewing the handle). Rotate the blade mounting hardware 180 degrees (on both the handle and the top of the saw). Spin it 180 degrees and put it back in. Flip the pins around and rotate the blade to get this arrangement which is more stable and more steerable. You lead where you want it to go, instead of following where it has been. 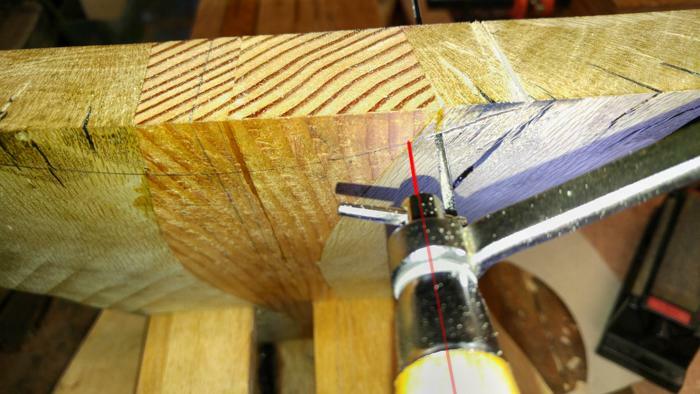 By following these simple steps, your cutting blade now trails the center-line of your hand. You lead, the blade follows. As an added bonus, the steering pins actually point in the direction you are heading, instead of uselessly pointing to where you have been. I was thinking that there must be others before me who have discovered this trick. So I searched as best I could to find any other references for it, but I only found a single image on a post from Derek Cohen on “In the Woodshop” where he shows his Olson coping saw, and it is set-up the way I describe [link]. He makes no special mention of it. Of course, not all saws need this adjustment, there are some, that can’t do it because the blade is already at the center-line of the saw. Most antique coping saws and some modern versions have connections that allow the saw to ride at the center-line. 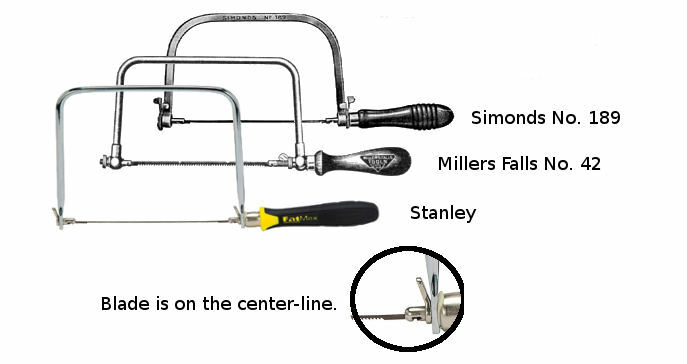 I have an old Disston coping saw that has the blade ride on the center-line (similar to those shown above). While this seems like it would be ideal, I actually find that these are a little bit harder control since you have no real indicator of where you are headed. The center-line only points to where you are, not where you want to be in the next few cycles of the saw blade. What about Coping saw push or pull? Ok I have seen a lot of questions on this. A decent saw with a rigid frame can handle setting up the teeth so they cut on either the push stroke or the pull stroke. The deciding factor for me is whether I want the splintered face on the side of the wood that is facing me, or away from me. If the”pretty side” is facing me while I cut, then I put the blade in to cut on the push stroke. This leaves the side that is away from me get all tattered. Other than that, I find I have a bit more control with it cutting on the pull stroke. In either case, I set it up so the blade is behind the center-line, rather than in front of it. Which coping saw do I like best? I have seen a lot of buzz about the Knew Concepts saws. They look amazing and get good reviews (they have the blade on the center-line) I just do not use coping saws often enough to justify the price. I do have both a Groz coping saw and an Olson coping saw. I prefer the Olson. It simply has a more solid feel to it. This post made think about it a bit! I’ll try it for sure. I am not so sure if setting the blade above the center line really helps. But since it is easy to try, I will give it a go next time I am in shop. Thanks for sharing. By the way, do not set up a coping saw to cut with a push stroke.If the blade breaks, you know what could happen? Orient the show face so you can cut with pull strokes, to keep the risk of injury to a minimum. If it has never happened to you, it doesn’t mean it won’t. Many came to know about this risk from experience.